A few days ago Verity my niece, celebrated her 21st birthday. If 21st is out of your teens celebration then why not 20th? 21st means freedom which I have really never understood. Freedom from what? Freedom from parents some might say but isn’t it good to have parents looking over you all the time whether you are 21 or 50? I feel that 21st signifies to one that hey time to become independent, grow up, take more responsibilities etc. Its like one day you are still a kid and bang on your 21st there are a lot of expectations from you. Well, Verity deserved a special treat on her birthday. 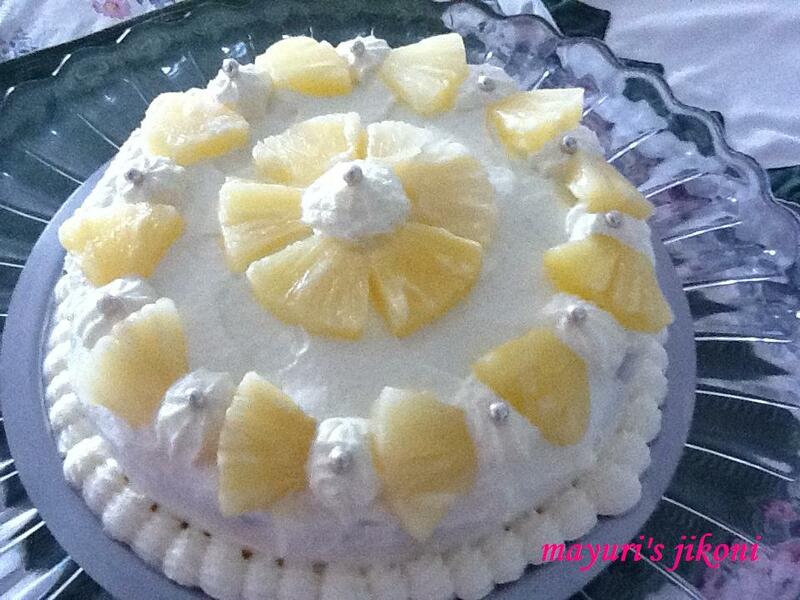 I made this eggless pineapple cake with fresh cream. This is an original eggless cake recipe from Tarla Dalal book, I just added the pineapple in the cake too. Grease a 6 inch cake tin. Dust it with flour. Or line the tin with greaseproof paper. Sieve flour, baking powder, baking soda, ginger powder and salt together. Drain out the pineapple into a sieve but save the juice. Cut a few pineapple pieces finely till you have about ½ a cup. Save the rest to decorate the cake. Whisk condensed milk, melted butter and ½ cup juice together. Fold in the flour mixture into the liquid. Bake at 180°C for 15 to 20 minutes and then lower the temperature to 150°C. Bake for a further 10 minutes or till the cake is done. If you prick the middle of the cake with a fork or toothpick it should come out clean. When the cake is done remove it from the oven. Leave it in the tin and gently prick the top in a few places with a fork. Brush the top with some of the pineapple juice. Let the cake cool in the tin for 5 minutes. Remove it from the tin and let it cool down completely on a wire rack. Whip the cream with icing sugar till it is thick and forms soft peaks. Using a spatula or butter knife, spread the cream all over the cake. Keep in the fridge for 30 minutes or so before you serve it. Make sure the cream is cold before you whisk it. As soon as its forms peaks when you lift the whisk, don’t whisk further otherwise the it will turn into butter. Add icing sugar to the cream according to your taste. Make the cake the previous day to save on time. Excellent cake to serve as a dessert. Can add cardamom or cinnamon powder instead of ginger powder. I just the combination of pineapple and ginger. Remove the remaining condensed milk into a container and leave it in the freezer till you need it again for a cake or other recipes.